Civil society in Nicaragua faces growing restrictions as political power has become increasingly concentrated in recent years. On 14th December 2018, the Ministry of Governance announced the cancellation of the legal personality of nine CSOs working for the promotion of democracy and human rights in the country. On 14th December 2018, the Ministry of Governance announced the cancellation of the legal personality of nine CSOs working for the promotion of democracy and human rights in the country: Centro de Información y Servicios de Asesoría en Salud (CISAS), Instituto de Estudios Estratégicos y Políticas Públicas (IEPP), Centro de Investigación de la Comunicación (CINCO), Centro Nicaragüense para los Derechos Humanos (CENIDH), Hagamos Democracia (HADEMOS), Instituto para el Desarrollo y la Democracia (IPADE), Popol Na, Instituto de Liderazgo de Las Segovias (ILLS), and Fundación del Río. According to the authorities, the above mentioned organisations were involved in activities "aimed at destabilising the country". The government action against civil society was approved by the National Assembly based on the General Law on Non-Profit Legal Entities and the Organic Law of the Legislative Power. This law, empowers the National Assembly to cancel the legal status of an organisation “when it is used for the commission of unlawful acts”, “when it is used to violate public order”, or “for carrying out activities that do not correspond to the purposes for which it was created”. "The true intention behind the cancellation of the legal personality of these organisations, without guarantees of due process, is to restrict the ability of the organisations and of human rights defenders to carry out their legitimate work in defending human rights in Nicaragua". The Commission also regretted that the decision ordered the seizure of the human rights organisations’ assets, leading to a number of illegal raids by the police to their offices, stealing computers, documents, vehicles, and other sensitive materials for their operations. "The State resorted to abusive and indiscriminate use of force to repress peaceful protest demonstrations. A repressive pattern, which was verified at different times and places, was the use of firearms, including war weapons, directly against demonstrators". The GIEI’s investigation identified that the police acting sometimes in coordination with armed paramilitary groups was the main perpetrator of violence against peaceful protesters. Before the report was released in the country, the government announced the expiration of the term, mandate and mission of the Interdisciplinary Group of Independent Experts (GIEI). In addition to the state restrictions of NGOs, legal harassment against human rights defenders also continue in Nicaragua. On January 2019, the Prosecutor’s Office requested the court to increase the prison terms for HRDs who already have been convicted. As reported previously on the Monitor, at least 300 people were reported to have been prosecuted for their involvement in the protests. Some of them are currently facing trial while others have been handed down heavy sentences. In addition, other HRDs, had to leave the country fearing threats of an arbitrary legal process against them. This is the case of Amaru Ruiz, Director of Fundación del Río, who had to leave Nicaragua after the National Assembly removed the legal registration of the organisation; after he was receiving threats of a legal process against him by the authorities. As reported previously on the CIVICUS Monitor, human rights defenders and social leaders have been systematically subjected to state harassment by prosecuting activists of terrorism, organised crime, and similar offences. Example of state harassment is the following case: Medardo Mairena, Coordinator of the National Council in Defense of Land, Lake and Sovereignty and Pedro Joaquín Mena Amador: both were arrested at the airport in July 2018 and sentenced on terrorism charges by a court in February 2019, receiving long prison sentences - 216 years in prison Medardo and 210 prison term for Mena. As reported previously on the CIVICUS Monitor, the police continue to reject requests by social movements to hold marches and demonstrations. Recently, the Centro Nicaragüense para los Derechos Humanos, requested to conduct a protest in commemoration of the 70 years of the Universal Declaration of Human Rights but the police denied it arguing that the organisation was being investigated for its participation in the alleged coup attempt. La Policía Nacional no autoriza marcha convocada por el CENIDH por carecer actualmente de junta directiva legalmente constituida. According to the Fundacion Violeta de Chamorro, between April and December 2018, 712 cases of attacks on the freedom of the press were documented by the organisation. Main responsibility for these attacks was attributed to the police that accounted for 239 of the cases, followed by supporters of the ruling party responsible for 193 cases and then armed paramilitary groups with 97. In addition, at least 55 journalists were forced to leave the country since the crisis started in order to protect their personal integrity. On 21st December 2018, the police raided the offices of Canal 100% Noticias, a private owned cable and internet media outlet. As reported by Verónica Chávez, the Director’s wife, the officers broke into the media offices, destroyed most of their equipment and arrested Director Miguel Mora and part of the staff. Mora was charged with crimes including "inciting hate and violence". The case of Lucia Pineda Ubau was especially concerning as her whereabouts were unknown for about three days after the arrest. On 24th December 2018, Pineda had a first hearing in which a local judge ordered preventive detention and set the next hearing for 25th January 2019, which was postponed a few times for 30th January and then for 25th March. As previously covered by the CIVICUS Monitor, supporters of the ruling party set on fire Radio Dario offices on 20th April 2018 when the crisis started and its Director, Anibal Toruño, was forced to leave the country for the constant threats against his life. Freedom of association is recognised in the Constitution of Nicaragua. Nevertheless, numerous gaps and contradictions in General Law on Non-Profit Legal Persons (law no. 147) allow for the exercise of discretionary authority over CSOs. Legal recognition requires approval by the National Assembly, which is currently dominated by the president’s party – the Sandinista National Liberation Front - and, according to civil society actors, selectively blocks or delays applications. Civil society organisations also face harassment and intimidation. For example, three armed men attempted to break into the offices of the Grupo Estratégico por la Despenalización del Aborto Terapéutico in March 2015. The Nicaraguan Constitution supports freedom of assembly, and according to the Manual for Individual and Political Rights, gatherings of more than twenty people require prior notice. 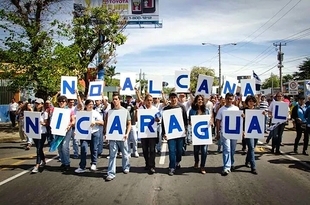 The Nicaraguan Constitution supports freedom of assembly, and according to the Manual for Individual and Political Rights, gatherings of more than twenty people require prior notice. Public demonstrations are generally allowed, but police frequently use excessive force against protestors and fail to protect opposition demonstrators against aggressive behaviour by pro-government supporters. According to the local organisation Centro Nicaragüense de Derechos Humanos (CENIDH), during 2015 many demonstrations and protests were blocked and in some cases even repressed by security forces and pro-government groups. On 8th March 2016, International Women’s Day, a peaceful demonstration led by women’s organisations calling attention to gender inequalities and violence against women was blocked by anti-riot police despite having the required authorisation. Freedom of expression is constitutionally recognised, but restrictive media policies have proliferated in recent years. Freedom of expression is constitutionally recognised, but restrictive media policies have proliferated in recent years. Defamation and libel remain punishable by substantial fines, and the recent reduction in the number of legal cases against journalists is likely due to self-censorship. Unlike radio and print, the television market is dominated by two media conglomerates, one led by a Mexican media mogul which concentrates on entertainment, and the other is controlled by the president’s family and is increasingly used to disseminate government propaganda. The ruling party also owns radio stations and news websites. Critical media outlets and journalists report threats, harassment, and physical violence perpetrated by both government and private actors.There is no direct censorship, but freedom of expression is restricted by a lack of information. Civil society has repeatedly stated that the authorities do not comply with the Access to Information Law of 2007. The president has never held a press conference and communicates instead through cadenas nacionales; -joint broadcast, over various media (usually radio and television), directed at the general population of a state-.The first lady is the only authorised government spokesperson. While independent journalists’ requests for interviews are denied, friendly ones are granted exclusive access to government events and press briefings. Critical media is also financially strangled by the arbitrary allocation of government advertising. No restrictions have thus far been placed on the Internet, which is currently accessed by less than 20% of the population.